Do you remember those animal-related movies we used to watch when we were kids, the ones we can barely handle as adults? Movies like Fox and the Hound, Homeward Bound, and Milo and Otis? They’re filled with frustrating moments and memorable heartbreaking scenes. Yet, the happiness of those movies far outweighed the sadness, and made it worthwhile to watch over and over again. Well, those childhood movies are similar in many ways to fostering an animal. Training a new pet and bringing them into your nuclear household can have its frustrations, giving up the pet you fell in love with can be heartbreaking, but the overall joy, happiness, and satisfaction generated from doing a good deed and changing the life of an animal in need makes fostering worthwhile. This is the reason many people return to pet fostering time and again. Why do people foster animals? When a pet is surrendered from their current home, or rescued from an inhumane condition, animal rescues often prefer to avoid the overwhelming environment of a shelter. Many rescued pets are already facing a very stressful situation, being separated from their home or recovering from danger. For these animals, living in a shelter can increase their anxiety making a foster home their ideal living situation. Also, shelters have limited means and can only keep animals for a brief period of time. By opening their home to these animals, fosters increase living space and lengthen the time and potential a pet has for finding their forever home. When placed in the proper home, pets can have the comfort of free movement, engagement with other pets, and the socialization of their foster parents. This eases the transition and helps better prepare an animal for their future home. What is it like to foster a pet? Similar to people, all animals have unique needs and personalities. Whether you open your home to dogs, cats, birds, bunnies, or chickens, fostering is unique on a pet-to-pet basis. That being said, as a foster parent, there are certain steps you can take to increase success. When fostering a pet, here are a few things to remember. Be Patient. Your new family member is already under a lot of stress. They don’t understand their situation – why they have left their home or why they have been treated poorly in their previous setting. You must be patient with animals in this position. Give them time to adjust. Consider making a room or space theirs, so if they want to relax there alone it’s ok. Give them space if they need it. Make them part of the family. Do not create a distinction between your own pets and your foster pets. They will feel it. If your dogs sleep in a kennel, give your foster dog a kennel. If they sleep on the bed, give him/her that option too. If you need to separate them, that’s ok. Just make sure you aren’t alienating your foster dog for your pets and visa versa. Your pets also need to know they haven’t lost their place in the household, so make sure you’re also giving them the attention they require. Begin training right away. It’s never too early to begin learning good habits, and it’s very likely your pet has never been taught. They may have good habits and not-so-good habits. Either way, they are not likely to come with a training manual or personal profile, so it’s your job to teach them. Our most recent foster didn’t know any commands including his name. We had to immediately begin teaching him important words including no, stay, and come. On the other hand, he was housebroken and kennel trained. You may have to housebreak the pet to your home as well. Teach them where the litter box is, or set a schedule to take them outside regularly. Set clear expectations and stick to them. Your pet will be much happier and behave better if he/she knows what’s expected in your home. Make sure he/she is healthy. Watch for any signs that your foster pet needs healthcare. Depending on the rescue organization you’re working with, the pet should already have their shots and a vet check before they arrive, but you still need to be aware. Many foster pets have been neglected and may have hidden health issues that need addressing. These issues may not have been noticed during the vet visit and could include stomach issues, anxiety, etc. Give them lots of love. The best way to help your foster “child” adjust is to give them unconditional love. This is the most important thing to remember when fostering a pet. They need attention, affection, and love. Above all else, this will help them adjust and grow. Anyone can foster a pet, but you do need to consider whether or not now is the right time for you. Adding another member to your household is a lot of work. It’s intensely rewarding, but it is also challenging. Be prepared, and understand you must be willing to care for the animal, train them, and nurture them. Here are a few things to consider before fostering a pet. Examine your living situation. Are you suited for another pet? Is your home large enough? Do you have a yard? If you rent, make sure your landlord will approve another pet in your home. Can you afford it? Depending on the rescue you’re working with, foster parents may be responsible for zero expenses, or they may be responsible for quite a few. Make sure you know what the expectations are, and whether or not this is a financial option for you. Do you have time? Fostering a pet requires a lot of extra time. You need to be able to exercise them, train them, and spend time with them. Make sure you are prepared for that commitment. If you are not prepared to foster a pet, now may not be the best time for you. That does not, however, mean you cannot foster in the future. Remember, if it’s not a good situation for the foster parent, it won’t be a good situation for the animal. The last thing you want to do is move them from house to house because the fostering situation isn’t working. If you don’t have time, there are other options too. You can start by volunteering at your local shelter. They always need people to help at pet drives, walking dogs, grooming them, petting cats, and giving them all a little T.L.C. Warnings aside, if you do qualify, and you are ready to foster a pet, than fantastic! You are ready to take part in a very rewarding and growth engendering experience. While there will be challenges, the benefits to all involved make fostering worth every trial and success. If you are ready to foster a pet, call a shelter and get on board! What if I fail as a foster parent? There is no shame in failing as a foster parent. I have fostered three pets, a cat and two dogs, and failed once. When you fail as a foster parent, it means you have become so attached to the pet you just cannot bear to let him/her go. This tends to happen to all regular foster parents at one time or another. If it does, you have just gained yourself a new family member who will love you absolutely for the rest of her life. Foster parents are generally softhearted animal lovers, and be weary it is always a possibility you may fall in love with the pet. 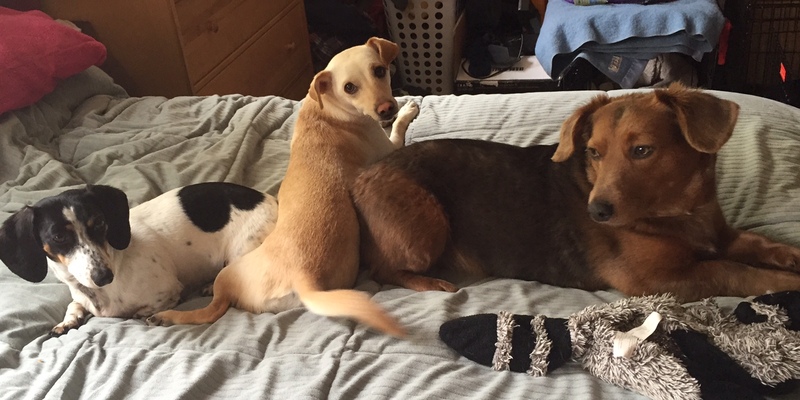 I am writing this post because last night I brought foster dog number three to his new home. We partnered with a local rescue, Loving Heart Animal Shelter to foster Oskar who we began to call Kenai. As mentioned earlier, it was a very rewarding and heart wrenching experience. It is always hard to give up a pet you have come to love and enjoy in your home. However, this emotion is very small compared to the joy and satisfaction derived from finding the perfect home for your foster animal. When I visited Kenai’s future abode, they had purchased him a fancy new kennel to sleep in at night. It was modeled on child playpens and offered the perfect little cuddle hole for Kenai. Their four year-old daughter was bubbling over with excitement, their six-year-old boxer was sprinting up and down the halls with glee over her new playmate, and the parents were simply gushing with love. How did Kenai feel? It was clear he had finally found his forever home. I reserve the opinion that dogs smile, and Kenai’s smile spread from ear to ear, split by a lolling wagging tongue. He is the happiest of dogs. He has found a home where he will be treasured, and he in turn will make them very happy. As foster parents, Joe and I were a part of that happiness. We had the opportunity to give Kenai a resting place, and because of our role he was discovered and adopted by a family who lived right across the street. If I hadn’t volunteered, they probably would never have found him. 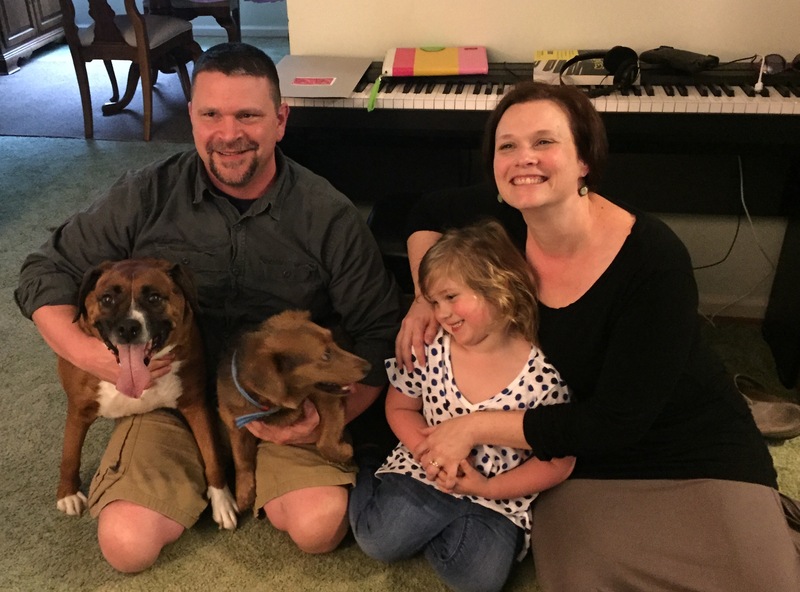 This is the essence of fostering – making a difference not only in the life of the dog, but the family who will love him. The more people who foster, the more lives we can save, and the greater difference we will make in this world. If you are not ready to foster right now, it’s ok. You may be some time down the road. If you are ready to foster, please seriously consider it. You will never regret your role in the dog’s life and the future happiness you will create. The planet is populated by 7 billion people. While that is a large number, it is miniscule compared to the number of animals with whom we share the planet. The Earth is a wonderful landscape of biodiversity, and it’s our job as the most influential species to ensure that biodiversity is maintained. Advocacy is raising awareness of the impact we bear on many different groups including endangered species and domesticated animals. Animal welfare groups are increasing in number and the support they receive from activists and donors is necessary to maintain this growth. One group of animals who tend to receive the least amount of attention is the group on which we are most dependent – farm animals. Farm animals meet a variety of human needs including clothing, food, and labor – not to mention companionship. The number of animals used in agriculture is shocking. The population of cows in the US offers some perspective. According to the National Cattlemen’s Association, in 2014 there were 89.9 million cows in the US alone! Because of our dependence it is disheartening we take these animals for granted and know so little about the intelligence, emotions, and capabilities of farm animals. Animal Place in Grass Valley, CA works to raise awareness and advocate for health and wellness of farm animals including cows, goats, sheep, chickens, ducks, and pigs (to name a few). This great organization offers opportunities for people all over the world to learn more about the animals we depend on and to help improve their situation. While their work is year round, they will be having an event to take note of this summer. On June 5-7, 2015, the organization will be hosting the first annual ANIMAL PLACE FARMED ANIMAL CONFERENCE. Attendees will have the opportunity to tour the facility, spend time with the animals, participate in interactive workshops, and listen to engaging speakers. The whole purpose is to discover more about farm animals and learn how to become stronger advocates for this wonderful group of animals. If you’re in the California area this summer, make time to travel to Grass Valley, one of the most beautiful regions in the state, and take part in this great new event. If you are unable to attend, visit the organization’s website, and consider stopping by the facility at another time. You can also offer your support by donating or fostering an animal. Make the future brighter for this important group of beings.